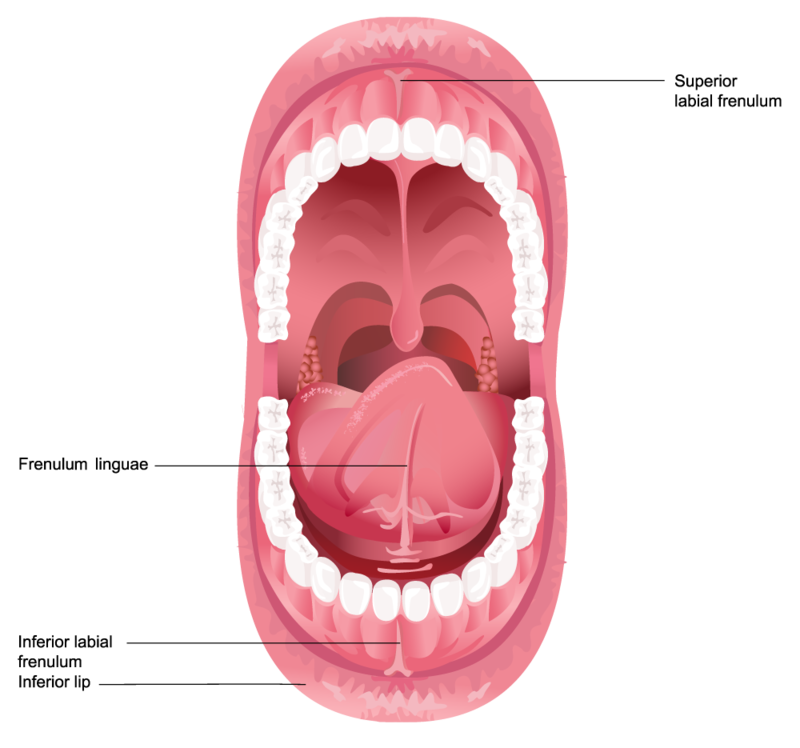 Overly tight or large frena, the folds of skin within the mouth, can cause problems with nursing and pronunciation. By treating tongue-tie, you can help your child avoid a lifetime of challenges, including difficulties at school or work and a diminished sense of self-confidence. When is a Frenectomy Appropriate? An overly large labial frenum can affect dental alignment, causing a gap to appear between the two front teeth. In more severe cases, this tissue can cause pain in the upper lip and gums, and limit movement. Excess tissue can also affect the fit of dentures. A labial frenectomy can reduce discomfort, improve overall aesthetics, and stabilize dentures. A tight lingual frenum can restrict tongue movement, making it difficult for babies with this condition to breastfeed. Older children with a tight lingual frenum can experience a condition known as “tongue-tie.” This can make certain sounds hard to pronounce, especially ‘d,’ ‘l,’ ‘s,’ ‘t,’ and ‘th.’ If your child is tongue-tied, it is important to address the condition quickly before irregular speech patterns set in. It can sometimes be difficult to detect a tight frenum yourself, but you can ask your dentist or physician to evaluate your child’s smile. A frenectomy is a simple procedure that only takes a few minutes. Your dentist, oral surgeon, or periodontist can begin by numbing the area. You or your child may be eligible for additional forms of sedation should it be necessary. The doctor can then make a tiny snip in the frenum using a scalpel or a soft tissue laser. Excess tissue can be removed as needed. Laser technology is becoming increasingly common among dentists and oral surgeons. Diode lasers can instantly eradicate unwanted tissue, simultaneously cauterizing the area to close blood vessels. As a result, lasers can often eliminate bleeding and the need for stitches. Lasers are also extremely precise. Your dentist can remove a small amount of tissue without impacting the surrounding area, causing less overall discomfort. Frenectomies typically have no downtime, and many patients do not notice any postoperative side effects. If you do experience symptoms, they are typically mild and may include minor bleeding or a slight burning sensation. Patients can usually return to work or to school the next day. To prevent infection, it is important to observe the site closely for about a week and contact your dentist if you notice any unusual symptoms. Your doctor may recommend a specific mouthwash, peroxide, or topical vitamin E solution to promote healing. When you work with a qualified practitioner, you can feel confident that your risk of complications is minimal. By treating tongue-tie, you can help your child avoid a lifetime of challenges, including difficulties at school or work and a diminished sense of self-confidence. If your child has already started to talk, you may need to work with a speech therapist to reverse any irregular speech patterns. Treating a tight frenum can greatly improve your baby’s overall health, as it can improve his or her ability to nurse. Your baby will be able to more easily take in nutrients, which can improve weight gain and growth. Nursing will be more comfortable for you, as well. Removing or reducing a large labial frenum will allow your orthodontist to perform appropriate treatment to close the gap between teeth. If your child has not started teething, a frenectomy can prevent this issue from developing at all. If an excessively large labial frenum keeps dentures from fitting correctly, a frenectomy will allow you to receive a comfortable and secure restoration. Your dentures will look more realistic, and you will have a lower risk for gum sores, bad breath, and gum disease caused by a loose prosthetic. Having a frenum that is properly shaped and sized can dramatically improve oral function and the beauty of your smile. Speak to your dentist or an oral surgeon to learn more.